So I thought this photograph of Yasser Arafat kissing the ring of John Paul (he of the "Me, Tarzan. You, Jane." machismo) would get your attention. And comments are open, just in case anyone has any enlightening thing to say about kissing men's hands. I remember at my first communion, maybe around 1969, jockeying for position with the rest of the first communicants to have the chance to kiss the bishop's ring as he was leaving the church. I thought it was the coolest thing. We all did. Soon after that we stopped using the communion rail and I was exposed to my first "folk" mass. Church lost it's cool factor for quite some time after that and it's only in mid-life when I'm starting to rediscover some of that coolness. We had a cousin in the Vatican's diplomatic corps (Titular Archbishop and posted in several distant lands), so my aunt trained us in the proper ring-kissing etiquette early on, for when he would be passing through the United States. Then, of course, wonderful Italian nonno-type prelate that he was, the Archbishop would take off his ring and pectoral cross (gifts of Pope Pius XII, since he had been an underling to Montini in the Secretariat of State back then) - with a fancy opening in the back containing a sliver of the True Cross he said - and let all of the kids take turns wearing them. In latter years, he short-circuited the genuflection and maintained the ring-kissing (for those who were planning on a mere hand-shake) by combining shaking your hand with moving it right to your lips so that you HAD to kiss the ring whether you wanted to or not! Cardinal Cushing came to the parish once when I was an altar boy, and I remember everyone lining up at the open gates in the altar rail to meet him and kiss his ring . . . what I remember is his admonition to large Italian ladies, "No! No! No! Honey! Don't kneel down, if you pull me over neither one of us will ever get up again!" Ah, the Cush! Of course, around these parts now, Their Several Excellencies might as well be wearing their rings in their back pockets . . . seems to be the kind of obeisance they really prefer. And no one seems inclined to offer it. I can imagine such a scene in one or two bars in Glebe, but not the ones I frequent. As much as I love and respect Pope John Paul, this picture really makes me cringe. It's like Hitler kissing the Pope's ring. 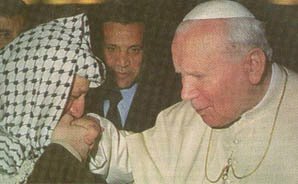 I suppose John Paul had his reasons for trying to intervene in that situation, but Arafat had so much blood on his hands that it would have been more appropriate for the pope to refuse this gesture.